Matoi is said to originate from troop commanders’ horse standards used in battlefields from 15th century. 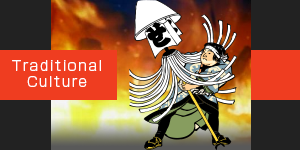 When the local fire brigades were first organized, they started to use them as symbols of each brigade, called matoi-nobori. Later they came to be a form of matoi, which is now familiar to Japanese people. 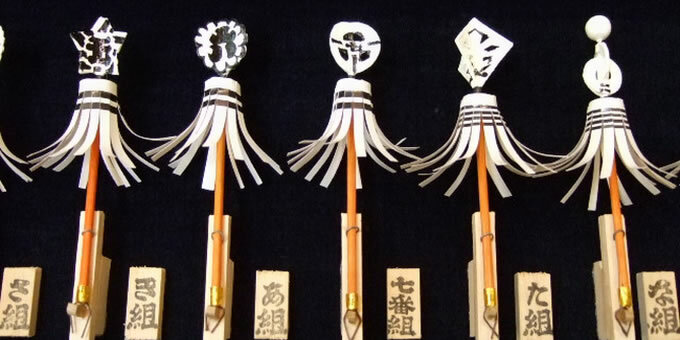 A matoi consists of the top part with a distinct design called dashi, 48 paper or leather fringes called baren and a rod part. 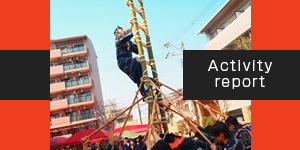 It is about 2.4 meters in length and 20kg in weight. Gallant designs, as seen in those of government-led fire barigades (daimyo-bikeshi and jo-bikeshi), were not allowed for matoi standards of local fire brigades (machi-bikeshi) and only black and white colors were permitted. Matoi standards are still symbols of respective barigades and are treated as symbols of their souls and solidarity.